The soundtrack for the 2018 American superhero film Black Panther, based on the Marvel Comics character of the same name and produced by Marvel Studios, consists of an original score composed by Ludwig Göransson and original songs produced by Kendrick Lamar. Göransson worked on all of director Ryan Coogler's previous films, while Lamar and Coogler had previously discussed collaborating and the musician agreed to produce several songs for the film after seeing an early version of it. After reading the film's script, Göransson traveled to Africa to research traditional African music for the film. He went on tour with Senegalese musician Baaba Maal, and recorded performances by Maal and other African musicians for use in the score. Notably, Göransson used recordings of talking drums and a tambin for character themes in the film, while Maal sung an original song for the opening of the score. Göransson combined these traditional African elements with the classical orchestra that is often used in superhero films. The orchestra was recorded at Abbey Road Studios, along with a choir singing in the Xhosa language. Wanting to match the film in terms of addressing important themes, Lamar decided to produce a full curated soundtrack album rather than just the few songs requested by Coogler. Because of the film's set release schedule, Lamar had less time to work on the album than he usually would. He began work with producer Sounwave while on tour, before completing the individual songs in collaboration with many different artists. One of these collaborators was Göransson, who worked on one of the songs and included elements from the album in the score. Coogler felt the album became its own piece of art rather than just a tie-in to the film. 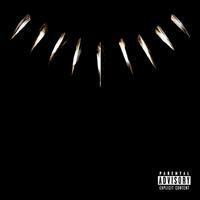 Lamar's soundtrack was released as Black Panther: The Album by Interscope Records on February 9, 2018, to large sales, including the top position on the Billboard 200 chart. Göransson's score was then released as Black Panther (Original Score) by Hollywood Records on February 16. The score was praised as unique among Marvel Cinematic Universe scores due to its authentic African elements and thematic material, but the album presentation was criticized as too long. Lamar's soundtrack was praised by many as a milestone for film soundtracks due to its ideas and lyrics, but it was considered by some to be not as strong as his solo work.